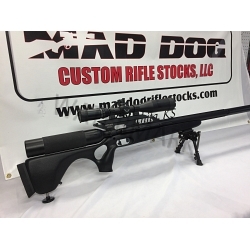 Mad Dog Raptor Long Stock for sale. Has a traditional form grip. Multi postional grip from field to bench. Ambidextrous. Works with all Texans to Talon P in all calibers. Stock only for sale. The AirForce Raptor Texan Short Stock includes 2 Sling Studs and Bench Leg. Stock is more traditional from grip forward. Multi positional grip from field to bench. Grip will fit all hand sizes. Deeper inlet, frame tube rides the entire stock with 3/8″ surface bevel on both sides. All Raptor stocks under 2LBS. Very strong for it’s light weight and where most of the research/development was involved. Extended buttpad for lower shoulder hold (5/8″ longer than standard). The stock design works perfectly on all rifles, from the Texan to the Talon P.
Inlet has a rubber spray lining to help bed the rifle. Weight 1 lb 14 oz, Lenght 32", LOP 14 1/2. Airforce Raptor Long fits the Condor, Condor SS, Talon, Talon SS, Escape SS, Escape UL, Texan and Texan SS. Life time warranty by Mad Dog Custom Stocks. Shipping included to the lower 48 states.